A Scattered Squee: Major updates. I've been very remiss about updating this blog. It's partially because I haven't been crafting, but mostly because I just haven't thought about it when I have been crafting. 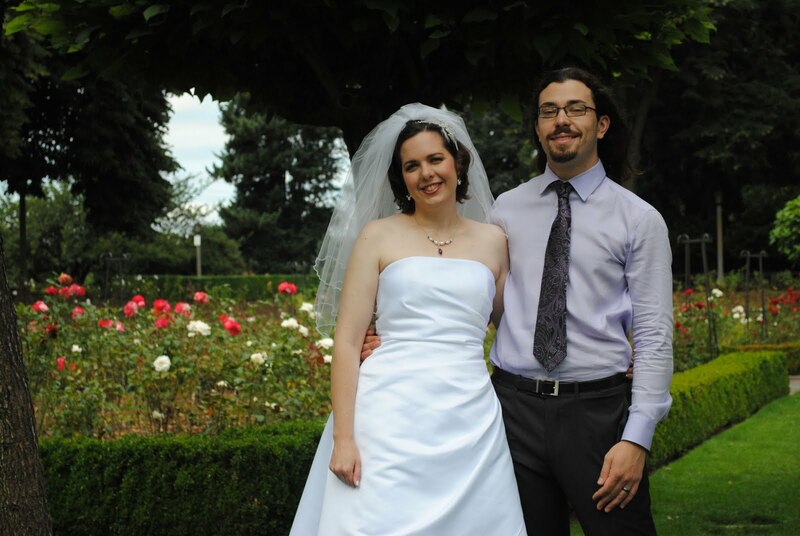 Also, I got married and went on a honeymoon and just got back at the beginning of this week. One of the first things I made was a purple petticoat to go under my wedding dress. It involved 180 yards of chiffon strips from this website. I never could have done it without chiffon pre-cut into strips. Also, without my ruffler foot, purchased specifically for this occasion. This was actually the second ruffler foot I bought for the project. The first was from amazon and was much cheaper, but didn't work well with my machine. Even with ruffler feet and pre-cut chiffon strips, the project probably took easily 30 hours. But it was worth it. We got married in the Peninsula Park Rose Garden, so I didn't want to do a lot of flowers. Instead, I had my bridesmaids carry pinwheels. 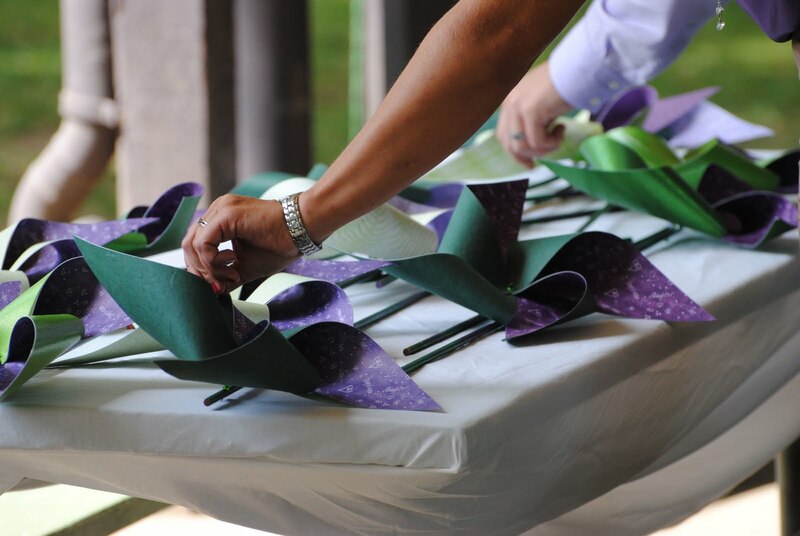 A lot of R&D went into these pinwheels and they would have made a great project to post about on here. However, I didn't and that's that. I don't even have any pictures of them in development or production. They were fabulous and sturdy and they spun, which was what I needed them to do. Here's me and the groom. I also made my veil, which involved hand-sewing a string of pearly beads to the bottom of two layers of shimmery veil stuff. Quite time consuming, but easy to do while sitting and watching a movie. Here's a portion of the ceremony. 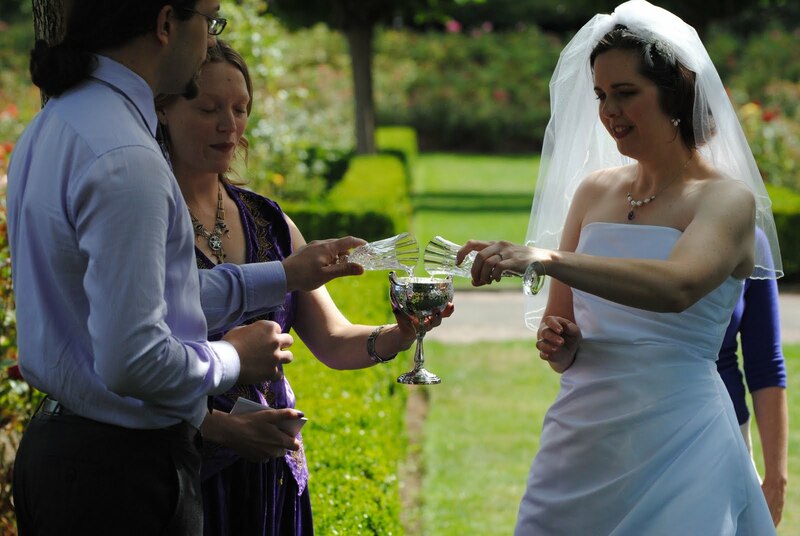 We're in the middle of the chalice ceremony where we pour both of our cups into one and then drink from it. We had a fabulous cake made by Pastrygirl in Portland. 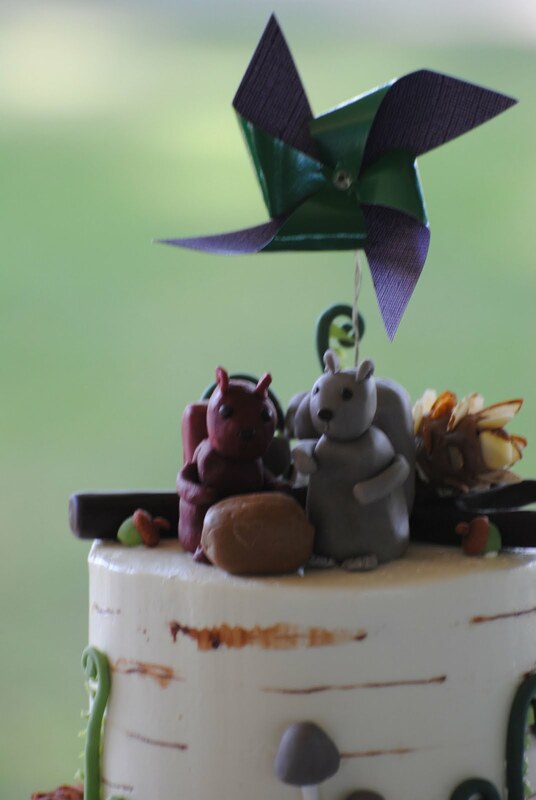 The wedding theme was squirrels and pinwheels. 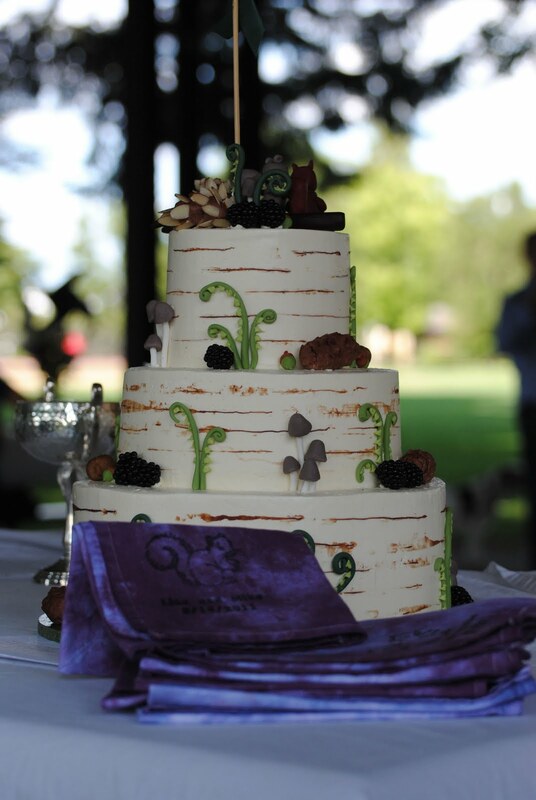 The cake was delicious. 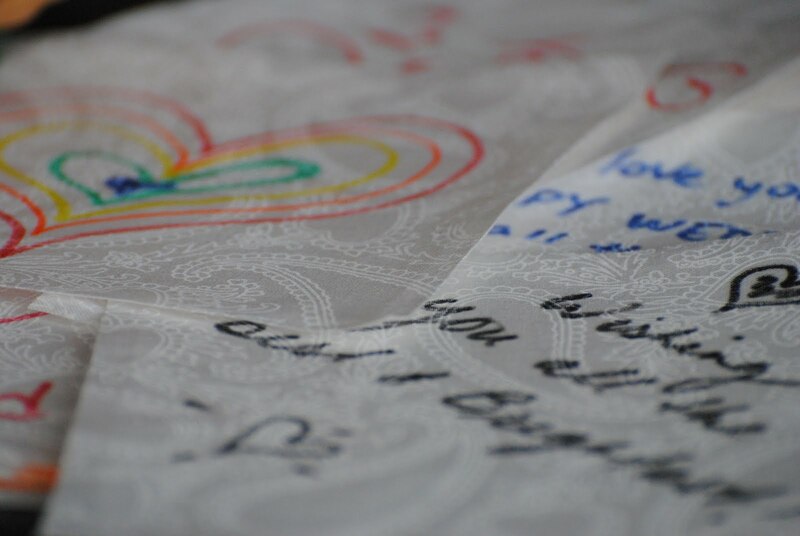 In the picture below, you can also see my tie-dyed napkins stamped with a squirrel, our names, and the date. These were our wedding favors. We had about 55 guests and I had dyed about 90 napkins.. and we only came home with 6 or so, so they seemed to be pretty popular. We also had pizza catered by the Girasole wood-fired pizza food cart. The food was great. There were three different kinds of pizza, antipasto skewers, and roasted veggies. Also, beer, lemonade and a variety of interesting sodas. Girasole was awesome to work with and I highly recommend them. Rather than having people sign a guest book, I had them sign quilt squares. Eventually, I'll be putting these together into our wedding quilt. 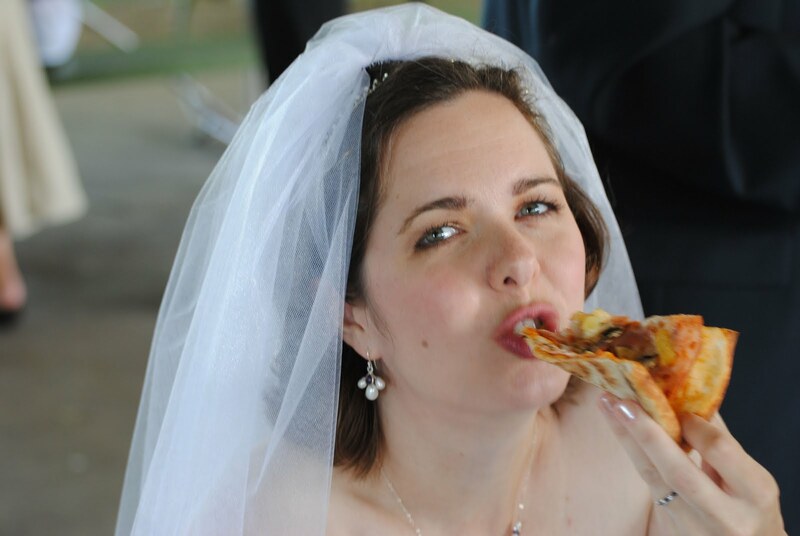 It was a fun wedding for me to be at, which was the overall goal. I wanted to have people and things that I enjoyed and to not be stressed out. It worked out fabulously well, mostly thanks to my excellent friends who helped me with everything. Congratulations!! Looks like a fun wedding. Love the pinwheels! Congratulations. 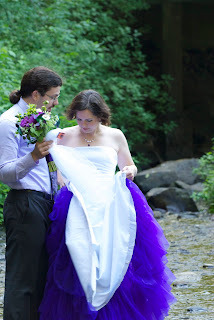 I love all the handmade touches and that purple petticoat is brilliant.